Widely known as "Uncle Tom's Calway Lot-O-Tumbler"
Polish. Enough for many batches. When we used the Lot-O-Tumbler for the first time we were really surprised. It doesn't look like a tumbler but it processed our rocks quickly and produced an awesome polish! The machine makes the load of rocks vibrate very rapidly and churn through the barrel with a thin film of grit on them. That thin film of grit turns every rock-to-rock contact into a rapidly-vibrating point of abrasion. The surface of every rock in the barrel turns into instant sandpaper! The Lot-O-Tumbler is fast. It will process a batch of rocks from rough to polish in under a week if you rinse the rock and add new grit every 12 hours. That is an easy job, you just lift the barrel off of the machine, pull of the red cap, fill the barrel with water, invert the barrel to drain, rinse again, add grit, and place the barrel back on the machine. Watch our video below to see how easy. NOTE: As with any tumbler, don't allow the used grit and mud to go down a drain - it can clog your plumbing. 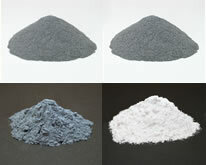 Only three abrasives are needed - 220 grit, 600 grit and polish (we have obtained great results on agate and jasper with inexpensive aluminum oxide polish, and the instructions that come with the machine give specific suggestions for other materials). The Lot-O-Tumbler uses very little grit and polish - less than 1/2 the amount of abrasives that you would use for the same amount of rock in a rotary tumbler. With a Lot-o-Tumbler you will save lots of money on grit and you will produce a load of finished rocks in under seven days - that's a lot faster than one month minimum in a rotary tumbler. That short tumbling time will save electricity too! The only downsides are: 1) the Lot-o-Tumbler must be attached to something heavy; and, 2) it makes more noise than a rotary tumbler - it hums! We run ours in a small room in our garage and think that the noise sounds like we are sitting in the cabin of a small commuter plane - but not quite as loud. If you have a shed or garage where a little noise will not be a problem then the Lot-o-Tumbler will work great for you. We run a single Lot-o-Tumbler in a garage that is below our bedrooms. We turn it on in the morning and let it run all day, rinse the rocks before bedtime and leave it off for the night. With that schedule we can still polish a load of rocks from start to finish in a little over a week. We got a standard concrete block, painted it to make it look nice, then used "Goop" to glue a single-barrel machine to the block. It works great. The instructions recommend gluing the single-barrel machine to a standard 40-pound concrete block (we filled the holes in our block with concrete for extra weight). 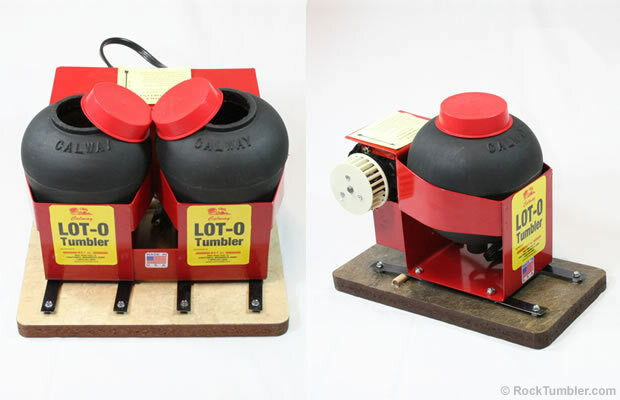 They recommend gluing the two-barrel machine to a 100-pound block or a concrete floor! You can see our Lot-o in operation in the video below. As with other vibratory tumblers, the Lot-O-Tumbler "smoothes" the surface of the rocks and does minimal rounding. If you like your tumbles nicely rounded, just run them for one or two weeks in a rotary machine and finish the job in the Lot-O-Tumbler. Here is how we use the Lot-o-Tumbler. If you have a rotary tumbler that produces four pounds of rounded rock per week then you can run both machines and finish a load of nicely-rounded tumbles every seven days. You will be running a gemstone factory!